Atlanta natives, and prominent Emory donors, Solon P. Patterson 57BBA 58MBA and his wife of nearly six decades, Marianna Reynolds Patterson 61C, live by the simple idea that “to whom much is given, much is expected.” But it all started with a boy meeting a girl. "We went to museums and did a lot of window shopping on the weekends, just walking up and down Fifth Avenue." In 1955 Marianna Patterson’s older brother, Richard J. Reynolds III 58LL.M. introduced his fraternity brother, Solon, to the girl with whom he would commit to spend the rest of his life. Undeterred, the pair were wed on October 29, 1960. They moved to a little apartment in Manhattan while Solon Patterson continued to experience managing the portfolios of the founders of Vick Chemical Company. Marianna Patterson worked for Bankers Trust Company doing economic research. Money was tight, but being young and in love, they didn’t mind. In 1962, the couple returned to Atlanta where Solon Patterson took a position as a portfolio manager for Montag & Caldwell – the only professional, independent investment counseling firm in Atlanta at the time. Six years later, he led the firm’s entry into the burgeoning mutual fund industry, creating the South’s first mutual fund. His work proved instrumental in building the firm into the powerhouse it became – and launched his own rise to chairman and CEO. As Solon Patterson changed the face of Atlanta’s investment industry, Marianna Patterson devoted herself to the equally important work of raising two young sons, John and Joe, and initiating the family’s considerable involvement in the non-profit world. Joe Patterson says the emphasis his parents always placed on giving back impacted his own choices. “We’ve learned from them by example to be generous and to try to help people who need help,” he said. "It is our privilege to provide a legacy to Goizueta Business School based on what Emory has meant to us..."
Throughout the decades, organizations in the community have benefited from the Pattersons’ generosity. 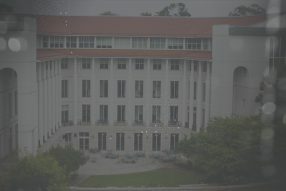 But Emory University and their family’s commitment to unity in the Christian faith, are closest to their hearts. Thanks to their efforts, Solon and Marianna Patterson were presented with the Emory Medal on September 20, 2003. But their work continues. Just recently, in fact, they committed a significant gift to the Candler School of Theology’s Aquinas Center. Faith and a passion for unity have defined their life. “We truly have come to believe that the reason we met and married was to one day work for the reunion of our beloved Churches,” Solon Patterson said. In addition to charitable gift annuities in support of Goizueta, Solon and Marianna Patterson honored both the Business School and the College with a naming gift that preserved the green space between the business school and the Donna and Marvin Schwartz Center for the Performing Arts. Many a student has spent time on Patterson Green…maybe meeting their future spouse.